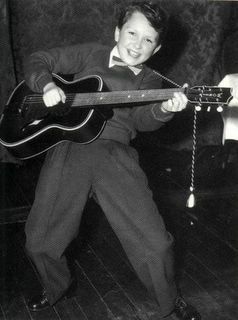 Pictured here is a young Jimmy Page appearing very "dazed and confused" probably from the lack of a "whole lotta lovin." I'm sure his parents experienced a "communication breakdown" plus years of "good times, bad times." It seems that some things are "what is and what sould never be." Following the demise of The Yardbirds, guitarist Jimmy Page was eager to fulfill booking engagements that were committed prior to the bands breakup. Page along with respected session musician John Paul Jones bonded together to form the nucleus of a group when Page contacted vocalist Terry Reid (Super Lungs) to join the band. But Reid turned-down the offer to peruse a solo career. However it was Terry Reid that suggested the contacting of vocalist Robert Plant who's career was struggling and uncommitted at the time. Upon Jimmy Page's offer, Plant accepted to join the band and brought aboard his drummer John Bonham to seal the deal. 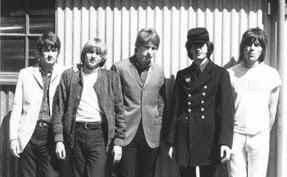 Immediately the band jellied as a foursome and hit the road calling themselves The New Yardbirds. But it was drummer Keith Moon of the Who that laughed when he heard of a patched-together band and impersonating as The New Yardbirds and suggested that Page's idea would "go down like a led Zeppelin." Thus the bands name, Led Zeppelin. At the time Atlantic Records was closely monitoring the UK music scene when Zeppelin scored an entrance level artist contract with the record label based upon two key elements. First, Jimmy Page had developed a reputation as the lead with The Yardbirds, a band known for avant-guard guitarist. And second was the intangible twist. Atlantic Records recording artist Dusty Springfield who was currently riding the charts with success had mentioned to Atlantic VP Jerry Wexler about Jimmy Page's impressive session work and notable reputation. But check this out. Strong rumor inhouse at Atlantic has it that Wexler agreed to have the band signed founded purely upon Dusty Springfield's suggestion and without hearing tapes of the band. If this story is true, which doesn't surprise me and based upon Wexler's musical taste and lack of appreciation towards the English rock invasion, the signing of Led Zeppelin to the record label was an absolute whim. Upon receiving strong FM airplay support and immediate retail chart success, Chairman Ahmet Ertegun quickly shuffled to arrange a photo session with himself and Jimmy Page to publicly acknowledge the bands signing. Denmark Terminal. 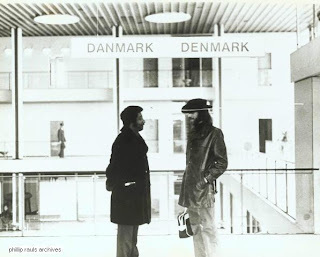 Drummer Al Jackson Jr. stops between terminal gates to speak with Mar-Keys Don Nix. (Circa~early 70's) This photo is puzzling as both look engaged in a serious conversation. However, my knowledge is that very seldom have either engaged in serious conversations. Two free spirits with great individual sense of humor. Back home as a Anglo-Memphian, I was starting to recognize the blemishes within the brilliance of the local music scene. It appeared the musical groove had lost it's luster and was stuck in the mud. Many of its key players were jumping ship like the sinking of the Titanic. I scanned the surface and noticed the musicians who were staying appeared to be settling for under achievement. Why hang around here and play the honky-tonks? After all, the entire world now knew about the local music scene. But wait, the chief mechanism for advancement was powered by the local record company. Hmmm...Got Pop records? 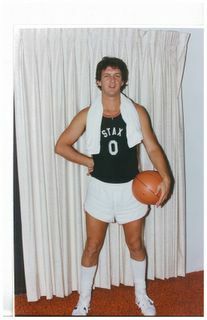 It would be easy to take pot-shots at the flaws of individuals who were in the drivers seat at Stax. But why waste the time. I chose to strap-on my seat belt and jump aboard the Atlantic ride whereas I was just beginning to spread my wings. Don't get me wrong, I love my musical heritage and my years invested towards promoting Memphis Music but I was starting to hear the beat of a different drummer. The Stax team changed directions with new leadership that didn't recognize the same visions or open door policies as with Jim Stewart. Or maybe my allegiance with Stewart was the issue. Whatever the case, I didn't take kindly to sitting on the bench. I was now being treated as if I was too big to play guard but too small to play forward. That's when Atlantic Records drafted me into their starting lineup. 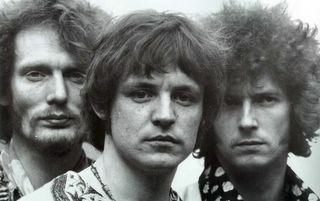 Cream changed the dynamics for blues/rock with their flowing lyrics, falsetto verses, heavy riffs, big amps, wah-wah pedals, fuzz boxes, distortion techniques and rolling drum patterns. Atlantic Records has a rich history in the recording of Black music giants. From Ray Charles to The Coasters, LaVern Baker to Aretha Franklin, Ahmet Ertegun's label has been a pioneer of the marketing of Soul and Jazz music since the beginning of dirt. Ertegun along with his partners Jerry Wexler and brother Nesuhi, together they were industry leaders and always pushed the ticket. However the marketplace was fickle and only the strong survived. But through the resilience of Atlantic's accurate signing combined with strong promotion and marketing, they remained an industry leader. An enormous break-through came when Atlantic signed a white blues band from England. Former Yardbird guitarist Eric Clapton formed a power trio called Cream and linked the R&B and Jazz label into the era of the psychedelic movement. It appeared for a blues and R&B aficionado like Eric Clapton to join forces with a label rich with tradition, this was a perfect match. And indeed it was. Creams' four dynamic albums released on Atlantic were artistically creative, technically unique and excellently produced. It also brought into the forefront producers Felix Pappalardi and engineering by Tom Dowd. Photos by Robert Whittaker and Carol Friedman. 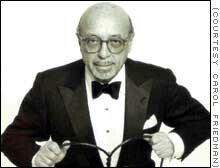 Atlantic Records founder and chief executive Ahmet Ertugen. In my opinion, there has never been a more astute record executive in the entire record industry than "The Mad Turk". 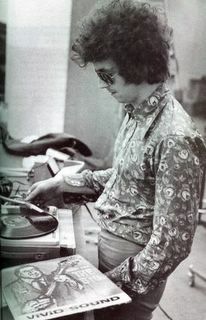 Eric Clapton listening to a record by Stax recording artist Albert King. 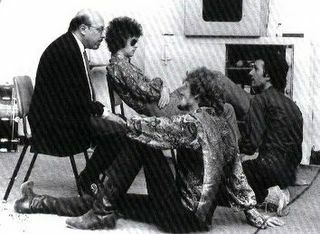 Ahmet Ertegun chatting with Cream drummer Ginger Baker. Sitting in rear with sunglasses is Eric Clapton and producer Felix Pappalardi. Being invited to Atlantic Records in New York was a thrill. Upon arrival, I was trusted into the famous recording studio for a photo session for a album cover and Billboard Magazine ad. 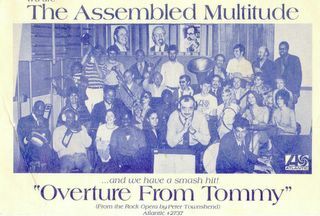 That's me top left in striped shirt with trumpet. Front and center bowing with head set is legendary producer Arif Mardin. Note background posters of (L-R) Nesuhi Ertegun, Ahmet Ertgun and Jerry Wexler.